Advanced Dungeons and Parenting: Shadow of the Demon Lord is Frighteningly Good [Part One] -- Could It Be Satan? 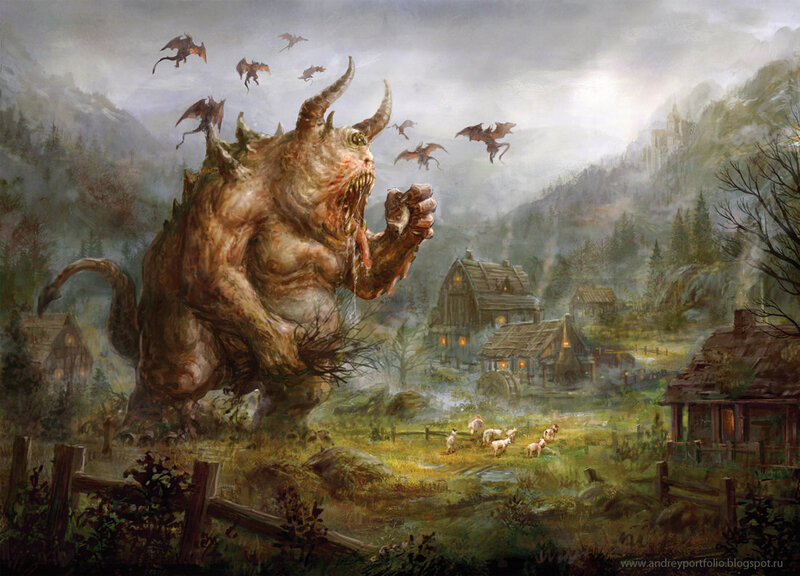 Shadow of the Demon Lord is Frighteningly Good [Part One] -- Could It Be Satan? 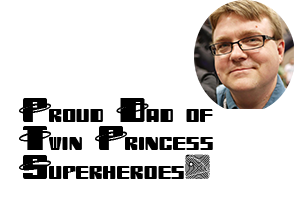 Robert J. Schwalb prefaces his new role playing game Shadow of the Demon Lord with a brief discussion of how he entered into the role playing game hobby. As with many of us, his introduction to the hobby was Dungeons & Dragons. Based on the fact that Schwalb asked Frank Mentzer to write a foreward to the game, I'm going to venture a guess and say that Schwalb and I share the fact that our introduction to D&D was Mentzer's excellent re-edit of the Dungeons & Dragons Basic set. I had a lot of fun with that game, and by the sound of it Schwalb did as well. 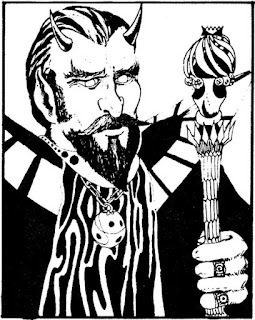 Schwalb's preface makes something else clear, we both had to "grapple" with the Satanic Panic of the 1980s and how that affected the way people viewed the role playing game hobby. It's in his description of his personal reaction to the Satanic Panic where Schwalb and I differ. In my own personal experience with Dungeons & Dragons, by which I mean the way my friends and I played it, devils/demons were viewed as imaginary generic villains to be defeated by devoted Paladins. In my young mind's eye, the devils and demons of the game were cartoony and less genuinely malevolent than they were "Maleficent." They were there to be defeated in the same way children defeated witches in fairy tales. When I encountered people who worried for the safety of my soul, I was more confused than angry. I remember when my parents moved to the Bay Area and we lived with a coworker of my father's while we found a more permanent residence. One night, while I was playing a game on the Atari, one of our hosts mentioned this sinister game that was threatening the souls of young children. I didn't hear the panic in the person's voice, I only heard the words Dungeons & Dragons, so I quickly interjected in an almost bored way, "yeah, I play D&D and I love it." This did not go over well with our hosts, but I don't remember the rest of the conversation. Yar's Revenge was more important than any criticism of D&D. It wasn't until a game group I was a part of had to play Star Frontiers instead of D&D due to "satanic" elements that I became annoyed. Why wasn't I worried? Let me give you a glance at some of the evil horrors that threatened to consume the soul of a D&D player. 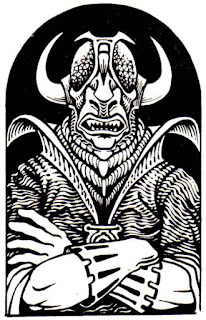 Here we have Asmodeus as he was portrayed in the AD&D Monster Manual. Don't get me wrong, those eyes are a bit disturbing. As for the rest of the image, I'd seen more disturbing get ups when I took BART over to Berkeley...and I'm just talking about the other customers at the local comic shop. Asmodeus doesn't look particularly "cool." He looks like typical 70s "sleeze" and that had zero temptation appeal. He certainly doesn't look frightening. The devils got a little more frightening with Baalzebul, the Lord of the Flies, but a horned beast head with fly eyes is only so frightening. Given that the image ins sharp line art, it lacks any real frightening impact and a guy who is "The Lord of the Flies" doesn't sound like he has a lot to offer a 10 year old. I mean c'mon, he's the Lord of things that eat poop. I'll just stab him in the face, IN THE FACE, with my Holy Avenger for the XP thank you very much. This isn't to say the artwork wasn't good. 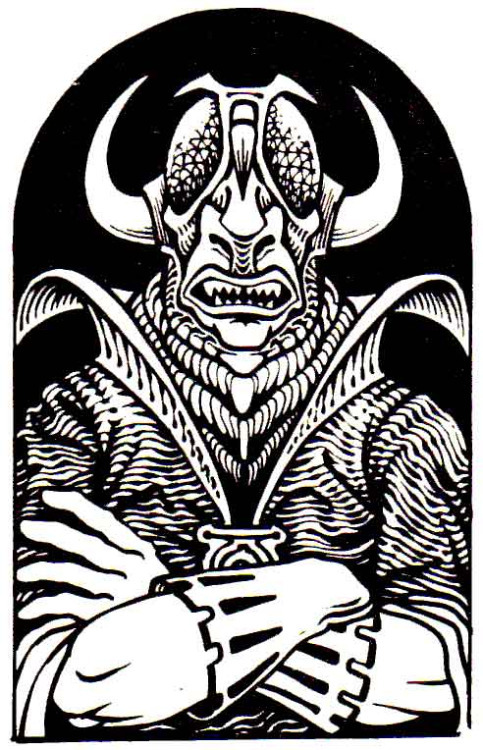 I really like the illustrations in AD&D, it's just to say that none of these images had any verisimilitude or compelled me to fall into devil worship. I'd rather tell a good story about good conquering evil. In a world where evil exists, and where we often feel helpless to fight it, it's nice to have a place where you know that Good will be victorious. That's my experience. Schwalb's was a little different. 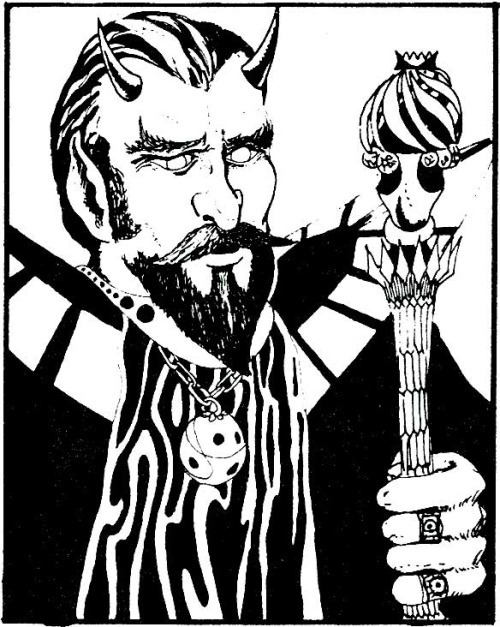 According to game designer Robert J. Schwalb's preface to Shadow of the Demon Lord, "D&D had been [his] game -- at least until it was decided there was too much Satan in its pages for me to play and keep my soul intact, and so I was forced to find other games to scratch my roleplaying itch. The Old World of Warhammer provided a far darker and scarier place than anything that D&D had to offer and thus it had me entranced." When I first read this, I almost read it as Schwalb thinking that D&D had "too much Satan" in it. Upon many re-readings, I've come to think that like my friend who was forced to play Star Frontiers instead of D&D to avoid "Satan" In my case, this created a journey from D&D to Flash Gordon -- and eventually superheroes. In Schwalb's case, this was a journey from Satan, to what my group jokingly called "Super-Mega-Ultra-Satan." 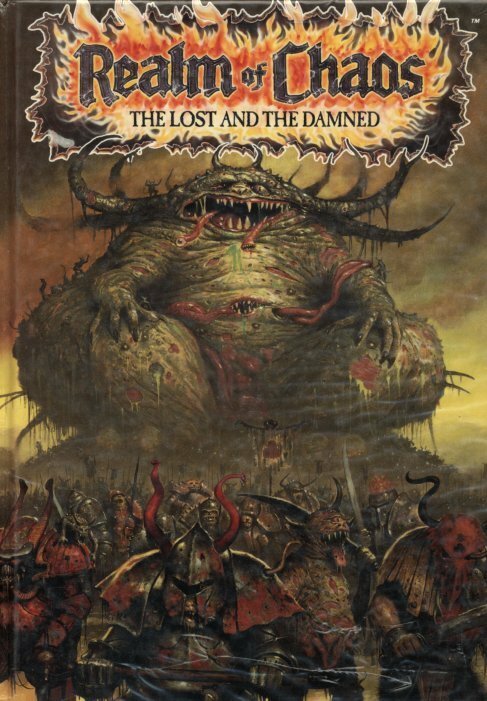 Let's just compare those D&D "Satanic" image above to the "non-Satanic" influences of Warhammer. Let's just say that Schwalb hit the nail on the head when he says it is a far darker and scarier place than D&D. 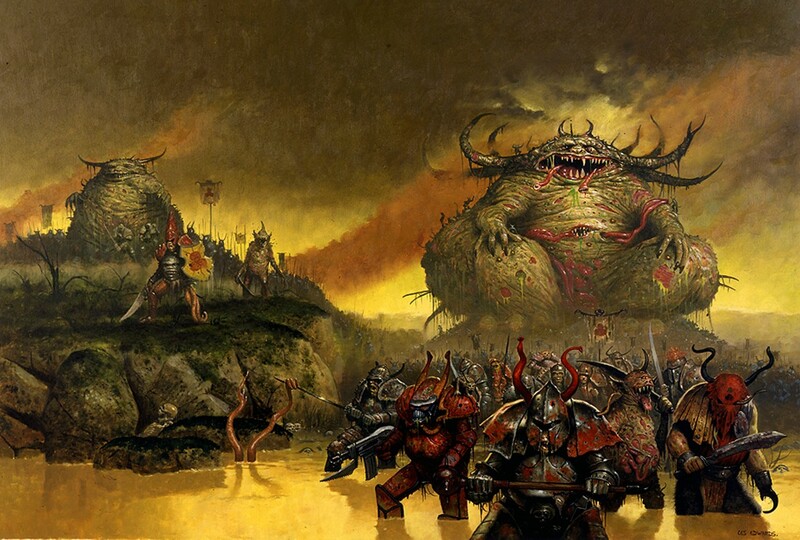 When one looks at the Chaos books of Warhammer, you can see why my friends call it "Super-Mega-Ultra-Satan." Also, it's amazing. My old Warhammer Realm of Chaos books are favorites of my collection. 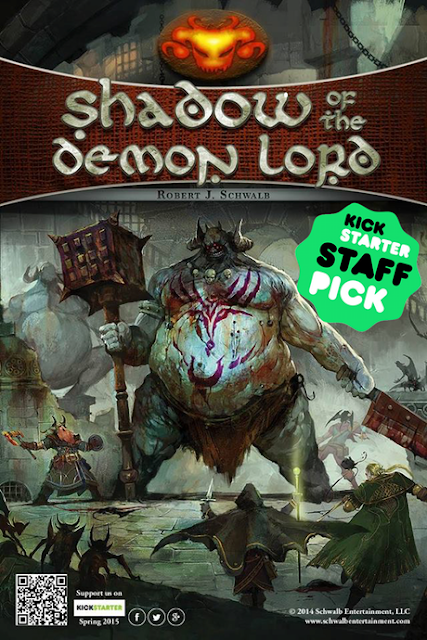 When you look at Robert J. Schwalb's new role playing game Shadow of the Demon Lord, you can see the influence of both D&D and Warhammer. The cover of the rulebook has a demon that is clearly influenced by D&D's Orcus, but the style and horror elements are dialed up to 11 and are pure Warhammer. None of these comments should be viewed as a criticism of Schwalb's game, which I think is one of the most exciting games both thematically and mechanically, I've seen in some time. Instead, they are an overview of some brief thoughts of how amazing it is that in attempting to avoid "demonic" imagery, a player ended up playing something that would probably have freaked out the Patricia Pullings of the world far more than D&D if they ever happened upon it. Given that the theme of this blog is gaming with kids, most of the future entries in this series will be about how to adapt Schwalb's extremely versatile system to "kid friendly" topics like Scooby Doo and Skylanders. Having said that, I had to write a post looking at how the Satanic Panic continues to influence game designers and gamers. I know that the Satanic Panic affected the way that I gamed for a time. It forced me to encounter new genres and styles of play. I still resent the stupidity of the critics of RPGs back in the day, but I can use a little motivated reasoning to find the silver lining of the clouds. Thanks to Robert J. Schwalb, some of that silver lining now includes "Super-Mega-Ultra-Satan."